We’d love your help. Let us know what’s wrong with this preview of Teller of Tales by Daniel Stashower. To ask other readers questions about Teller of Tales, please sign up. I found this a fascinating book of a fascinating man. I was amazed at the number and variety of things Doyle had a hand in- studied and practiced medicine, went on a whaling expedition, helped popularize skiing, championed justice for those the law falsely condemned, ran for politics (even sharing the floor with Winston Churchill at one meeting), was a war correspondent, tried to get enlisted in every war in his lifetime including WWI when he was 50 years old, started his own militia, was a play I found this a fascinating book of a fascinating man. I was amazed at the number and variety of things Doyle had a hand in- studied and practiced medicine, went on a whaling expedition, helped popularize skiing, championed justice for those the law falsely condemned, ran for politics (even sharing the floor with Winston Churchill at one meeting), was a war correspondent, tried to get enlisted in every war in his lifetime including WWI when he was 50 years old, started his own militia, was a playwright, wrote historical fiction and military history, was one of the first people in England to drive a car or to get a speeding ticket, had interesting friends from Houdini to Oscar Wilde. And, of course, most bizzare of all, his never-ending crusade to convince people that you could contact the dead and that fairies were real. This waw recommended as part of the bibliography/appendix of "The Sherlockians." I found many things here which can explain how the man wrote and how he thought about logic and life. Recommended! Išsami, stora, (pa)skaitoma biografija apie žmogų, nelabai norėjusį istorijoje liktų tik Šerloko Holmso autoriumi, tad iki gyvenimo pabaigos mėginusį įsitverti ko nors reikšmingesnio. Principingą, net jei tai grėsdavo kone visuotine pajuoka. Kad į gyvenimo pabaigą susižavėjo spiritizmu - teko girdėti, bet nesitikėjau, jog iki tokio lygio. Graudi "fėjų" istorija, balansavimas ant saviapgaulės ribos. Kartais toks įspūdis, kad tiek jis, tiek visa aplinka tiesiog turėjo į valias laiko - o tuomet miru Išsami, stora, (pa)skaitoma biografija apie žmogų, nelabai norėjusį istorijoje liktų tik Šerloko Holmso autoriumi, tad iki gyvenimo pabaigos mėginusį įsitverti ko nors reikšmingesnio. Principingą, net jei tai grėsdavo kone visuotine pajuoka. Kad į gyvenimo pabaigą susižavėjo spiritizmu - teko girdėti, bet nesitikėjau, jog iki tokio lygio. Graudi "fėjų" istorija, balansavimas ant saviapgaulės ribos. Kartais toks įspūdis, kad tiek jis, tiek visa aplinka tiesiog turėjo į valias laiko - o tuomet mirusiųjų šnabždesius išgirsi net medžių ošime. Ko gero, kaip ir daugelis, jaučiu dėkingumą, kad susilaikė į spiritizmo pinkles, matyt intuityviai, neįpainiojęs Šerloko. Interesting insight into Sir Arthur's life. A little known fact is he sailed from Peterhead, which is a town 45 minutes away by car. And he also was at Peterhead prison also. I was looking for, a non-fiction biography of Arthur Conan Doyle, one that does not treat Sherlock Holmes as a real person. This book won the 1999 Edgar (Allan Poe) Award for Best Biographical Work and came highly recommended. It is not one of the books that indulges in the fantasy that Conan Doyle was just a literary agent who helped Dr. Watson get his stories published. I knew very little about Arthur Conan Doyle before reading this book so it was interesting to find out how many of the 19th c I was looking for, a non-fiction biography of Arthur Conan Doyle, one that does not treat Sherlock Holmes as a real person. This book won the 1999 Edgar (Allan Poe) Award for Best Biographical Work and came highly recommended. It is not one of the books that indulges in the fantasy that Conan Doyle was just a literary agent who helped Dr. Watson get his stories published. I knew very little about Arthur Conan Doyle before reading this book so it was interesting to find out how many of the 19th century's authors and other prominent people knew him and were friends with each other. The index is practically Who's Who of the 19th and very early 20th centuries. It is funny to imagine Conan Doyle hanging with Oscar Wilde. The Teller of Tales opens with a Preface and an Introduction that I should have skipped. They almost form a very short summary of the book as well as an apology for Conan Doyle being nothing like Sherlock Holmes. Conan Doyle himself is quoted as saying "The doll and it's maker are never identical." And that is only too true in this case. But it would have been easier to have come to that realization in the course of reading the book rather than have it splashed on me like acid in the Preface. There is a trade-off in the absence of footnotes. On one hand, it is easy to read apace, unhindered by citations or references to sources. On the other hand, the reader is left to guess how the author came to certain conclusions. For example: that Agatha Christie had "mixed feelings" about Conan Doyle involving himself in the search when she went missing (he consulted a psychic) and that Conan Doyle's first wife was totally unaware of his (view spoiler)[decade of infidelity with her successor (hide spoiler)] although it was apparently common knowledge on the street. I marked it as a "spoiler" in case you are the other person who didn't know. I am wondering now if The Adventures of Arthur Conan Doyle: A Biography might have been a better choice. This was an excellent overview of Conan Doyle's life, with a relatively positive view of the man. I appreciated the positive view of Conan Doyle because I am (as I imagine most readers are) a fan of Conan Doyle and his work. 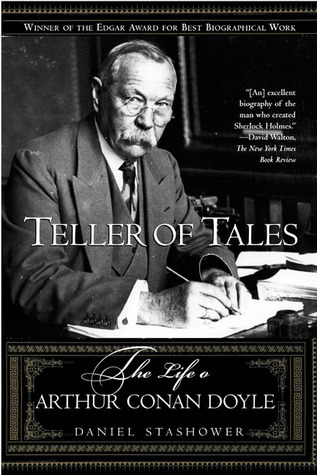 Conan Doyle had his faults but also many achievements aside from his writing, so I think this biography did a good job balancing the two. It was positive while not skipping over the faults. There was plenty of material about Holmes and Conan Doyle's non-spiritualist works, w This was an excellent overview of Conan Doyle's life, with a relatively positive view of the man. I appreciated the positive view of Conan Doyle because I am (as I imagine most readers are) a fan of Conan Doyle and his work. Conan Doyle had his faults but also many achievements aside from his writing, so I think this biography did a good job balancing the two. It was positive while not skipping over the faults. There was plenty of material about Holmes and Conan Doyle's non-spiritualist works, which I enjoyed more than the spiritualist side. Although I'm not that interested in Conan Doyle's spiritualist works or activities, that area of his life was handled well and with sensitivity, without glossing over the obvious problems with the movement and Conan Doyle's apparent gullibility. This is a very interesting book about a fascinating and enigmatic man. Enigmatic because it is difficult to understand how a mind that could create Sherlock Holmes, the ultra-clinical, ultra-sceptical detective, could also believe in fairies, table-tapping, "voices from beyond," and pretty much any other mystical twaddle that came his way. This book, however, goes some way to reconciling these two polar opposites, explaining how Scottish good sense prevented Doyle from using Holmes as a mouthpie This is a very interesting book about a fascinating and enigmatic man. Enigmatic because it is difficult to understand how a mind that could create Sherlock Holmes, the ultra-clinical, ultra-sceptical detective, could also believe in fairies, table-tapping, "voices from beyond," and pretty much any other mystical twaddle that came his way. This book, however, goes some way to reconciling these two polar opposites, explaining how Scottish good sense prevented Doyle from using Holmes as a mouthpiece for his Spiritualist agenda, while placing that agenda in the context of Doyle's personal grief at losing his son in the Great War. As it was the author's intention to emphasise the period in which Doyle's Spiritualist beliefs came to dominate his life, this biography may not be for those looking for a personification of the Great Detective. For balance, The Secret Life of Houdini by William Kalush and Larry Sloman is a cracking read, telling the story of how the escapologist and Doyle became first close friends, and then bitter enemies as Houdini carried out his crusade to expose fake (aren't they all?) Spiritualist mediums. I am not ashamed to say I was riveted to the reading of this biography about one of the best writers of the 19th century (and into the 20th). The writing style of Stashower is unmatched by any of the numerous biographies read (by myself) in the past. I would highly recommend this book to anyone who would have their interests (on the life of Conan Doyle) met and satisfied on many different levels. I think it is the author's way of taking what could have been a very straightforward and boringly to I am not ashamed to say I was riveted to the reading of this biography about one of the best writers of the 19th century (and into the 20th). The writing style of Stashower is unmatched by any of the numerous biographies read (by myself) in the past. I would highly recommend this book to anyone who would have their interests (on the life of Conan Doyle) met and satisfied on many different levels. I think it is the author's way of taking what could have been a very straightforward and boringly told story, and then offering it up in a way as to hold the attention. I can't really claim to have "read" this entire book, but I did read about 2/3 of it and I skimmed the other 1/3. It's a good example of why I tend not to read biographies of authors I like, simply because so many of them turn out to be nuts/jerks/unlikeable/etc. Conan Doyle was definitely a remarkable man, and I love the Sherlock Holmes stories, but I'm not sure that I needed to see just how flat-out crazy/delusional he turned out to be. Still, it was an interesting "read." Always heard about Doyle and so eventually wanted to read a biography. This one was well written and interesting and didn't drag on. Gave me a good insight into the man who brought the world Holmes and many other wonderful stories. Also intrigued by his mysticism and how he struggle just to remain a simple man and doctor among all the fame. A rather facile biography of Doyle. You learn things, but it seems to lack depth. Honestly, Mr. Stashower how do you know what Doyle's first didn't know? Not quite what Arthur & George put in mind for. A very shallow biography of Conan Doyle. Stylistically it was hard to stay with the flow of the narrative. Some good biographical information but I wouldn't recommend it. There must be a better biography out there somewhere. i loved this book and like sir arthur all the more! "He was a giant in stature with the heart of a child." An excellent biography of the author who created Sherlock Holmes.